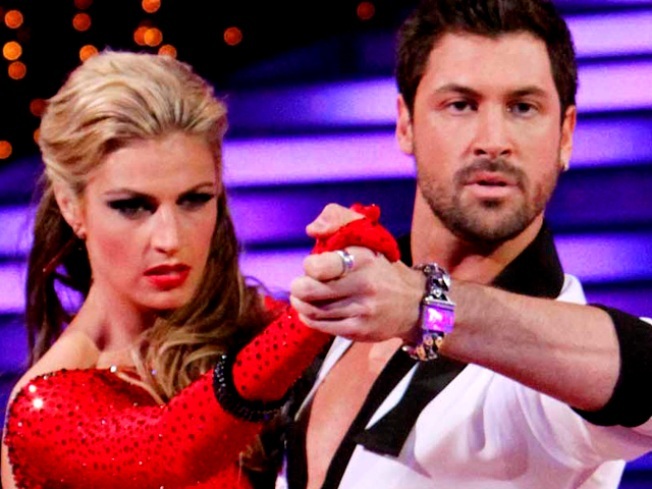 The chemistry between "Dancing with the Stars" pair Erin Andrews and professional dancer Maksim Chmerkovskiy has sparked rumors – and magazine cover headlines – that the two are dating, and during an appearance on "The Ellen DeGeneres Show," the rumored couple had fun with the gossip. "Do you want to tell us the truth?" Ellen asked of the rumored relationship on Wednesday's "Ellen" taping. "Is it a romance at all? Is it hot in any way?" "Depends on what day you get us on," Erin said. "We divorce every evening," Maks added. Maksim even joked about the rumors he's prepping the ESPN beauty's meals. "I'm an amazing cook, apparently," he said. Erin also opened up about why she decided to join the ABC reality competition. "'Dancing with the Stars' came to me before everything happened and said, 'We'd love to have you.' I was kind of tentative about doing it after everything broke with the stalker," she said. "But, I wanted to do it because this I thought it would be a great platform to come and talk to you. Come and be on a show where millions of people watch and just say, 'If you're stalked or a victim of video voyeurism you shouldn't be embarrassed, you should live your life. You're a victim, you didn't do anything to yourself.'" Erin, who not only faced her stalker in court recently, but has received death threats, said the cast of the show has been extremely supportive. "They've been a wonderful family. I've got a Russian on my side that isn't going to let anyone come near me," she said of her "Dancing" partner. "Evan Lysacek, said he would take his skating blade for anyone that comes near me. So it's a big family."